This feature enables you to return to a specific line item on a selection list, purchase order, or invoice after you have navigated away from the page that contained the line item. This feature is especially useful when you must identify a line item in a long list. 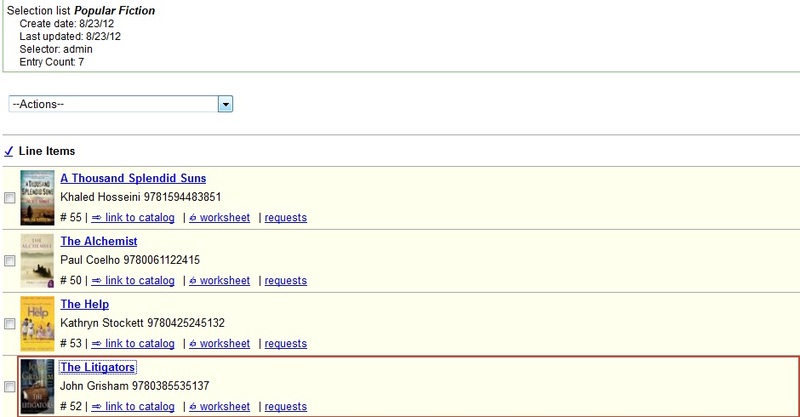 After working with a line item, you can return to your place in the search results or the list of line items. To use this feature, select a line item, and then, depending on the location of the line item, click Return or Return to search. Evergreen will take you back to the specific line item in your search and highlight the line item with a colored box. For example, you retrieve a selection list, find a line item to examine, and click the Copies link. After editing the copies, you click Return. Evergreen takes you back to your selection list and highlights the line item that you viewed. When displaying Acquisitions lineitems within the Selection List and Purchase Order interfaces, Evergreen displays a count of existing catalog copies on the lineitem. The count of existing catalog copies refers to the number of copies owned at the ordering agency and / or the ordering agency’s child organization units. The counts display for lineitems that have a direct link to a catalog record. Generally, this includes lineitems created as "on order" based on an existing catalog record and lineitems where "Load Bibs and Items" has been applied. The count of existing copies does not include copies that are in either a Lost or a Missing status. The existing copy count displays in the link "bar" located below the Order Identifier within the lineitem. If no existing copies are found, a "0" (zero) will display in plain text. If the existing copy count is greater than zero, then the count will display in bold and red on the lineitem. The user may also hover over the existing copy count to view the accompanying tooltip.